Anyone who thinks that email marketing is old hat would be wrong; email as a marketing tool is alive and well and still incredibly effective. That’s not to say that techniques haven’t changed though, they have, albeit not much. In 2013, email has a lot of competition, but it’s still one of those things that some people enjoy opening, for some reason. However, email is an incredibly competitive marketing tactic and so approach is everything. The modern consumer is a completely different animal to early internet users and this change has been brought about by social media. It’s changed the way that consumers and enterprises communicate and given the consumer more power. This means that when it comes to email marketing the rules have changed, albeit slightly. Now it’s important to address potential customers in a less corporate, formal manner. Just like with social, a friendlier, open approach is necessary. It’s also necessary to consider different devices with email marketing now, since a large proportion of people will access email via their smartphone. This means that it’s essential to design email templates that are mobile friendly, or risk them never being seen. 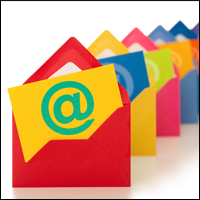 Another trend that’s on the increase is email personalisation. This means that all of the data you hold on a customer can be used, not only to address them by name, but also tailored to suit past purchases and behavioural data. This can be set up within a database and it’s just a question of getting a solution in place that is capable of looking at data such as past purchases and making suggestions for future buys, much like Amazon do. This encourages people to buy on a subconscious level, as it tickles them to think that they are getting email especially for them. This is the kind of thing that is more likely to get your customer telling their friends about the great service you provide too, and that kind of marketing is invaluable, as social marketing professionals know. We all know how important brand consistency is these days and email is no exception. The messages you send should project every aspect of your brand, from logos and colours, to tone and voice. Branding can be used in subject lines too, get bold with them and really try to get the flavour of your brand into a couple of words, so that you can stand out from the crowd that’s sitting alongside your mail in the inbox. If you can think of a new spin to put on your emails, then all the better. Some experts are predicting that animated Gifs will make an appearance in email marketing this year, but this remains to be seen. Personally, I expect it would annoy me considerably and make me hit the delete button, but we’re all different. Basically, anything you can do to entice the customer to connect with your brand is a good idea, so long as it’s relatively subtle and not too pushy. Further to this, it should also be at the forefront of an email marketer’s mind that the content of the mail should, if possible, be sharable, so that people can instantly share special offers and/or content with their friends. Email marketing isn’t dying at all, in fact if anything, it’s finally coming of age, so it’s well worth giving consideration to how you can best make the most of it to complement your social media marketing efforts. Setting up your next Social or Email campaign? Get in touch for an expert opinion from My Social Agency.